At Advanced Basement Systems, we're proud to offer a complete line of the best basement waterproofing products for your home. We offer patented and warrantied products from Basement Systems, Inc., including quality sump pumps and innovative new french drain systems for your home -- we also offer a full line of other products to help you upgrade your space. Feel free to browse our site to learn more about the waterproofing products we install. Our specialists can help you select the best solutions to solve any problem in your basement. If you're interested in having any of these products installed in your home, contact us to schedule a free consultation and we will provide you with a free estimate with no obligation. Whether you have an issue with your sump pump; cracks in your basement walls or floor; or a damp, ugly basement that you'd like to improve - all of our solutions are customized for your home. At Advanced Basement Systems, we have a team of in-house experts and warrantied solutions to fix basements, crawl spaces and foundations of all types. Are You Looking for Professional Waterproofers in Southwestern Ontario? We believe you deserve only the best. That's why our basement waterproofing system includes a lifetime transferable warranty, and all of our products are installed by trained and certified basement waterproofing specialists. 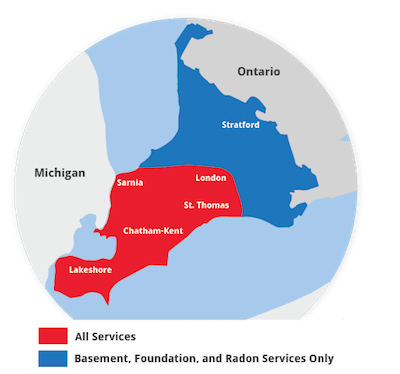 If you would like a free estimate, just call or email us today to schedule an on-site consultation, offered in Chatham, London, Sarnia, Windsor, Stratford, Windsor , Leamington, St Thomas, Amherstburg, Strathroy, Essex and nearby areas. We look forward to helping you!